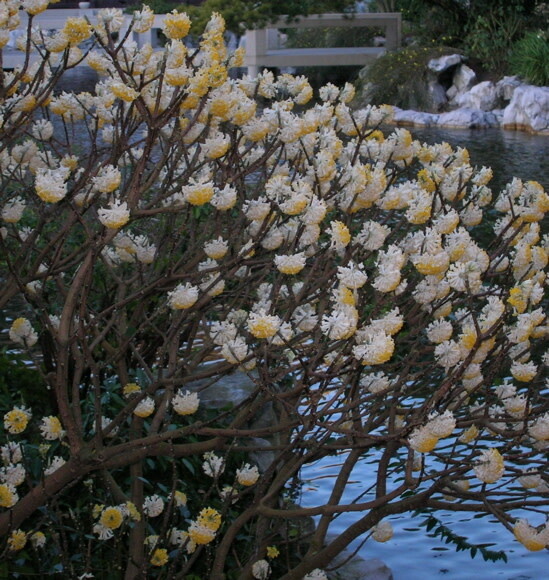 The other day, I compared the Chinese paperbush (Edgeworthia chrysantha) to the tropical Plumeria. And what’s the first thing I see when I get off the plane at the Honolulu airport? A Plumeria, looking for all the world like a paperbush! 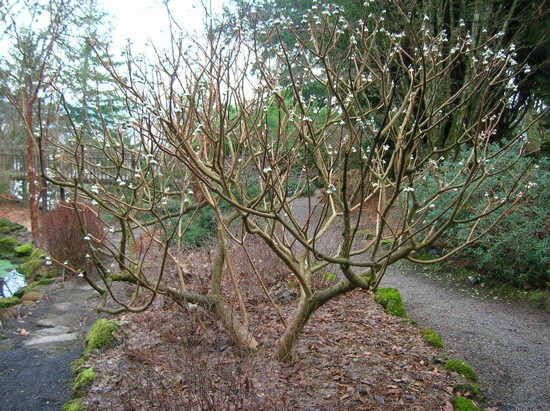 Here are two other photos of Edgeworthia chrysantha: in bud (above) and in flower (below). Both photos taken in winter, of course. Edgeworthia chrysantha ‘Gold Rush’ is the heftiest, most robust type, with big, rubbery stems like a Daphne on steroids and large clusters of sweetly fragrant yellow flowers in winter. Plants reach about 5-6 feet tall. 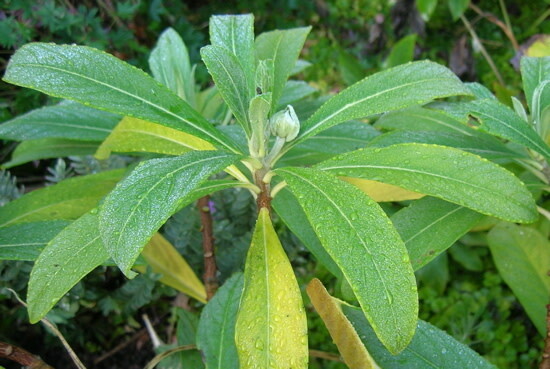 Edgeworthia papyrifera (or the plant typically sold under this name – it isn’t clear whether it’s a separate species or not) has similar lovely yellow flowers in winter that are less fragrant than those of Gold Rush. But the plant’s flowers, leaves and stems have a more refined, graceful appearance. The plant reaches about 5-6 feet tall and wide. Edgeworthia papyrifera ‘Akebono’ This plant looks delicate, the way E. papyrifera looks, but has reddish-orange flowers. The fragrance seems light compared to Gold Rush but the color is completely dazzling, particularly in the dead of winter, and it’s about the same height as the others. 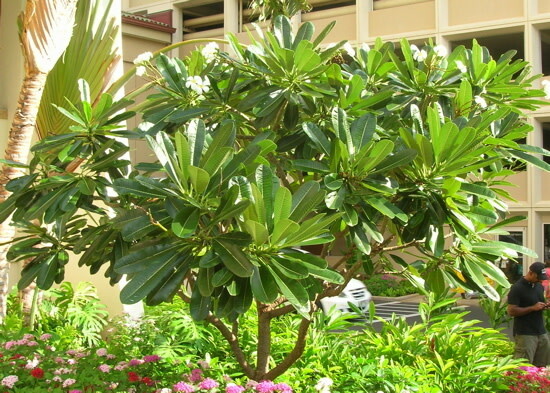 The Chinese paperbush’s foliage and appearance is so lush as to be downright tropical – yet it is cold-hardy to USDA Zone 7, so it is solidly in the "tropic-ennial" (tropical-looking yet hardy and perennial) category. And since it’s winter-flowering, it’s the next best thing to a Hawai’ian vacation for alleviating the winter blues.